India Launch its Most Powerful and Heaviest Rocket GSLV Mk-III. The Indian Space Research Organization (ISRO) launched its most powerful and heaviest rocket yet on Monday (June 5,2017), sending a communications satellite into orbit in a successful debut flight. The launch vehicle is Geo Stationary Launch Vehicle (GSLV) Mark III, which is heaviest such vehicle of India lifted off from Satish Dhawan Space Center Sriharikota(Andhra Pradesh), successfully delivering the massive GSAT-19 communications satellite into orbit. 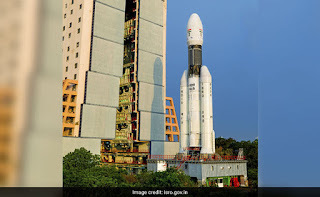 It(GSLV Mk III) is the most powerful and heaviest Launch Vehicle of India. It successfully delivered GSAT-19 in its orbit. It is capable of carrying payloads of up to 4,000 kg into the Geosynchronous Transfer Orbit (GTO) and 10,000 kg into the Low Earth Orbit., Now India will not depend on other countries for launch of heavy satellites. Weight of GSLV Mk III is 640 tones i.e. 6 lakh 40 thousand kg. It has cryogenic engine which use liquid oxygen and hydrogen as propellants. Apart from India 5 other countries developed and deployed cryogenic engine. It is a communication satellite, expected to enhance India’s communication infrastructure. placed into a Geosynchronous Transfer Orbit (GTO), 16 minutes after launch, with a perigee (closest point to Earth) 170 km and apogee (farthest point from Earth) 35,975 km. The satellite weighs 3,136 kg.